Is it true that Americans are paying too little tax? Current levels of overall taxation are close to the historical norm. So what’s changed? Research funded by the Kauffman Foundation shows that between 1980 and 2005 all net new private-sector jobs in America were created by companies less than five years old. “Big firms destroy jobs to become more productive. Small firms need people to find opportunities to scale. That is why they create jobs,” says Carl Schramm, the foundation’s president. So while I agree that the top 1% should be taxed more, and the bottom 99% less, what the above graph reveals is that America right now has is a spending problem, and not a tax problem. The next American President and Congress will face a stark choice as they seek a balanced budget — do they raise taxes or cut spending? Well, it’s an open question. Other nations spend far more than America, but they also tax more. 52% of French GDP, 37% of Japanese GDP, 47% of British GDP, 18% of Thai GDP, 32% of Swiss GDP, 78% of Cuban GDP, 27% of Indian GDP and 17% of Singaporean GDP is government spending. That’s quite a wide range. But to spend more you have to tax more, and that will be unpalatable to many Americans. America is really at a crossroads. Growth would be a panacea. But with the economy in a Japan-style depression, generating sustained growth will be difficult. This entry was posted in Economics, Politics and tagged big government, china, david cameron, debt-to-gdp, france, gdp, japan, newt gingrich, paul krugman is wrong again, robert reich, Ron Paul, united kingdom, wonkery. Bookmark the permalink. Isn’t this irrelevant? 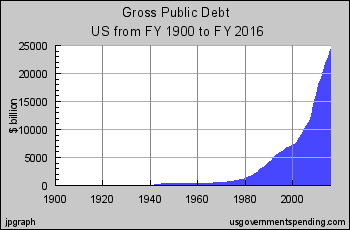 In a debt-based monetary system does it really matter? No matter how you tax or spend, the debt will grow or you will starve. Its the only way money comes into existence. We’re talking about spending as a percentage of GDP and tax rates, but shouldn’t we be asking if taxation is necessary? If government operated the fiat currency as a public utility it might be a different world. It’s not quite as simple as that. Many nations have successfully extinguished large amounts of their debt leaving a much more viable government debt-to-GDP ratio. The UK after 1945 is a very good example. So America has been maintaining the WWI-spending level since about 2008. Well done for the pseudo-Keynesians. The next American president should demand countries with American bases to pay the maintenance and personnel costs. America should repatriate its troops from countries which defy to freeride on its national security. 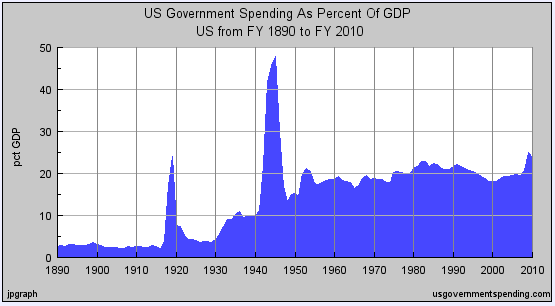 It would hopefully scale down America’s military budget to 3% of GDP or so. Bang on! I went to the USA 10 years ago, before Chinese imports wiped out their SME manufacturers. Bright employees, with savings of investment capital, are usually the innovators. They create the novel item, that usually is exported round the world. Apple’s humble beginnings is a case in point. But even if taxes were to be reduced, the raft of legislation that stifles business innovation (Could you imagine a new unique vehicle being made without all the safety and environmental laws to comply with) will still suffocate innovation. I use this example based on experience. In the 1980’s AMC Jeep had to comply with strict environmental laws. As a result their 1970’s technology engine were way underpowered, and they lost export markets, especially in Australia, which demanded power and fuel economy for long highway drives. (Smog controls ruined fuel economy and power). With the lack of exports they were gobbled up by Chrysler. The USA lost diversity. Any person with capital and the brains to innovate is better off moving to other Liberal dynamic countries. Africa could be the birthplace of Neo Capitalism. I’d argue the military-industrial complex is really a continuation of the organisation from WW2. You don’t know your history of the machine gun and arms sales, do you? When I asked a Government statitician for information on the spending of Government departments, how many staff they have, highest and lowest paid, median and average incomes his response was they can’t divulge that information. When I asked if I should contact the departments directly his response was. You might have better success contacting each department separately, although I’m not sure how willing each will be to part with that kind of information as it can be quite sensitive. So how do we hold Governments to account? How doe we stop departmental growth? In Australia the Public Sector pays better than the private secotr. I feel we could eventually have our Greek moment.